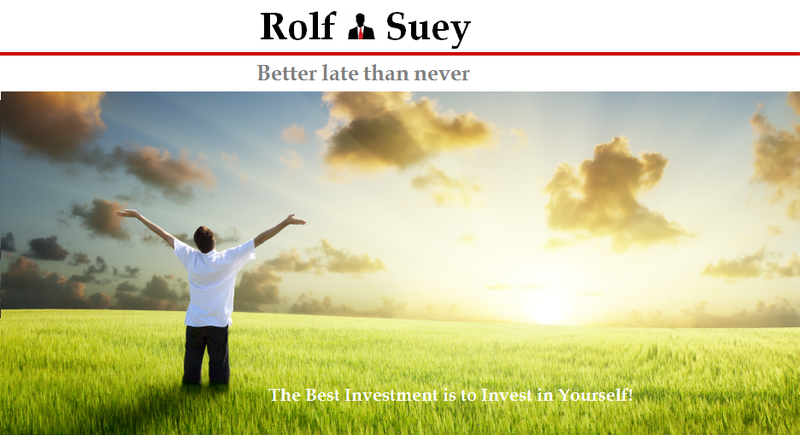 Rolf Suey - Better Late Than Never: Is Work Life Balance Only For the Financially Freed? I returned to office last week, after a fortnight of ICT, and work is piling. To make things worst, in the next month or so, my schedules are already packed either with overseas travel or visitors coming to Singapore. For all my ill-fated busy work schedule, I still appreciate that I am at least able to have weekend free, for my family including my 4-month old, and also time for myself. What is Work Life Balance (WLB)? Few days ago, I asked my wife what is the definition of work life balance (WLB)? She said spending quality time between work and family. Good answer, but not exactly holistic. Work Life Balance is Only For the Rich/Financially Freed? It's no denial that being financially free or having more money will put us in a better position of pursuing WLB. In most cases, it also provides the mental freedom to pursue our pleasure and leisure. A bigger purse can also help us to employ the best doctor when we meet with health problems. We are also able to have more expensive overseas family tours, expensive dinners, entertainments etc. For the lower income family, WLB’s correlation with money is even stronger. When asking the questions of Money being directly proportional to WLB, it immediately leads me to think of the below examples. I have many middle class friends in their mid to late 30s who, after setting up families want to have more time for their kids. They left their higher paying jobs in private sectors to join government sectors to have more time and better work life benefits. For e.g. several government companies had implemented Flexible Work Arrangements (FWAs) which includes flexi work start and end time; work from home few days a month. S’pore government has also started incentive for organizations who promote WLB or work-life friendly environment. To know more, please refer to MOM Work-life Grant – click here. So lesser income, for more time! Money is NOT directly proportional to WLB in this case! I had an ex-colleague and let’s call him Mr. L. He is 58 at that time, when we were working in the same company. Mr. L is successfully in his early career climbing in an MNC to MD position in his thirties. Mr. L is frugal and owns many properties all fully paid, supplemented with monthly rental income. His children are already working. In another words, money is never a problem. In fact, he is financially freed way before he is 50 years of age. Nevertheless, Mr. L did not achieve the WLB he deserved then, or at least the mental freedom he supposingly has in work. While in my company, for some reasons, Mr. L becomes an eyesore to the CEO. He was frequently picked, for matters not his fault. He was even humiliated in front of junior staffs. After office hours, he received repeated text messages pressurizing him on trivial work related matters. It was nightmare for Mr. L but strangely he continued to swallow his pride for more than 1 year. His wife, who is a highly paid executive, persuaded him to leave his job. Mr. L did not accede, even when later his Salary was halved. After he joined my team, I asked him why didn't he leave earlier, since money was never a concern of him? Are the sufferings worth it? The reply: "I needed something to do!" To me, this is a classic example of being financially freed, but not mentally freed! In my opinion, money is just a catalyst to WLB but definitely does not cause it. I have to admit I am financially stronger now than many years ago. But it does not mean that I have less work-life-balance at that time compared to now. Perhaps, it is a matter of mentality – Choice, Discipline and Desire! Perhaps it is more important to know yourself better, knows what you really love and want to do, earlier in your life. Rather than to wait till the latter part of your life, that even if you have financial freedom, you will still be mentally restricted! So how about you? Do you agree that having more money means having more work life balance? I think WLB is a matter of mindset. Learning when to say no is as important as when to be gung ho and say yes. I think sitting down, doing your sums and understand what is your own FU$ is important. It gives you a direct monetary value to when you can say no to extra work and when you should say yes. FU$... something to tell your boss? Am I right? Of course FF is very important, and I agree! It empowers us mentality and gives us the extra confidence maybe to do even better. Blending work with life is a very special privilege for people who have found it! U found it.... Congrats! "You don't think work/life balance, you just think life. Symbolic work/life boundaries are almost impossible to maintain. Why? You are your business. Your business is your life, just like your life is your business—which is also true for family, friends, and interests — so there is no separation because all those things make you who you are. Incredibly successful people find ways to include family instead of ways to exclude work. They find ways to include interests, hobbies, passions, and personal values in their daily business lives. If you can't, you're not living — you're just working. Thanks for the article. It is very nice and I agree. Provided you must love your work to be able to include family and interest in it. So it still goes back to the issue of knowing who u r n what u really want then find a work that u really like that can generate income n incorporate ur life! Ok I need to stop the Sh...t of always reminding knowing who we r? haha. Thanks a lot once again. Cheers as part of your amazing creating! I seriously liked going through this specific, you’re an outstanding copy writer. I wish to really encourage for you to hold yourself exceptional purpose. Right this moment click this cash advance spring-valley Employ a very good daytime!